Delays of 90 minutes were reported and police described traffic as “at a standstill” after a two lorry crash on the A14 in Cambridgeshire. 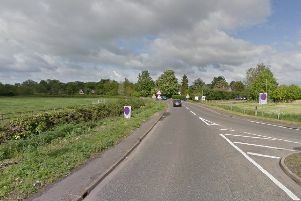 A police spokesman said: “We were called at 11.30am this morning (Wednesday) with reports of a collision on the A14 westbound at Hemmingford Grey involving two lorries, which includes a lorry transporter. “There are not believed to be any injuries, however there is oil spillage in the carriageway which will need clearing. Police advised motorists to avoid the area where possible, but the road has now been fully cleared, although residual delays remain. The crash caused queues back to Girton on the A14, and also onto the M11 to Grantchester. Traffic also queued back to Huntington on the A14 eastbound and the A1198 from the A14 back to Papworth Everard wass also congested. The crash closed the M11. Traffic was being taken off the motorway at junction 13 ease congestion on the A14 Westbound, where the carriageway was closed. Superstar jockey Frankie Dettori was stuck in the queue on his way from his home near Newmarket to race at Nottingham Racecourse and has had to be replaced by fellow jockey Pat Cosgrave.